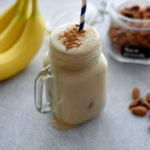 Creamy vanilla with banana and nuts. My kids LOVED this, and they actually said its BETTER than a milkshake. All the nutrients they need in 1 glass, OH HECK YA! Mom approved! add all of the ingredients to a blender. Blend on high speed for about 2 minutes until creamy.